I'm starting another thread, due to Photobucket messing up the previous one and deleting all my pictures. So, this will be about what I make, using recycled materials. Fabric, wood, plastics, wool, metal, anything. I can copy the pictures from my blog, it's easy and quick. A few to start the ball rolling. A small piece of a work in progress, an undersea adventure. 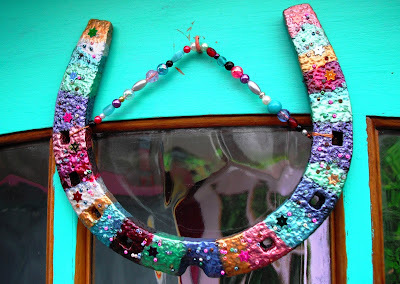 A decorated old horseshoe, found in my garden 20 years ago when I moved here. My friend removed all the rust with his grinder, I painted it with nail varnish bought at a car boot sale for 10p a bottle, added beads and sequins, and gave it two coats of clear varnish. Small tin from the £1 shop. 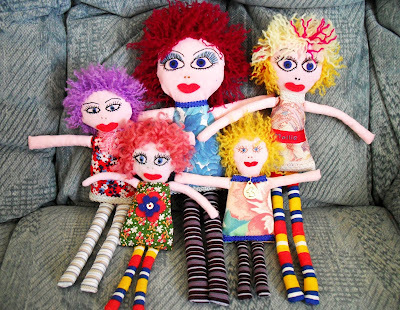 Skinny dollies made from cotton fabric scraps and wooly hair. 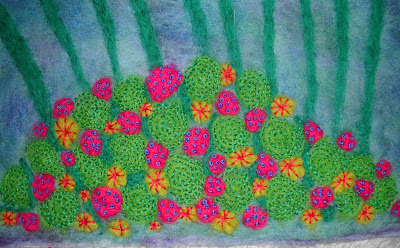 Abstract needle felting picture with lots of stitching. I was given a lot of felting wool. Painted second hand frame. An old tennis raquet bought from a car boot sale for £1. Covered in strips of red velvet, sequins and beads added. The centre is a piece of snooker table green baize. 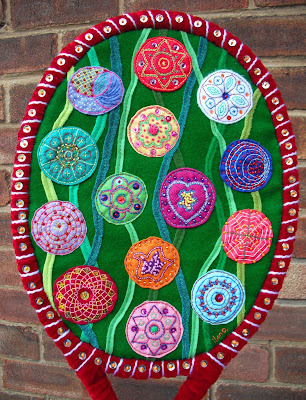 Suffolk puffs made from coloured circles, stitching and beads added. Hope that's given you some inspiration. I'll update when I finish some more projects. What a busy lady you are Ilona. 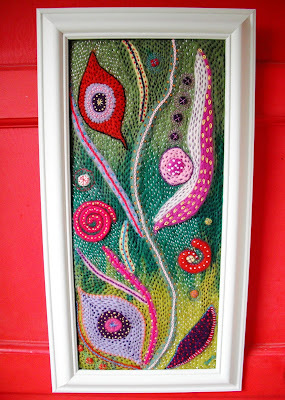 I love the needle felted picture but all were very pretty. I haven't yet found a way to put up pictures which is so annoying. Don't do twitter or have a blog so can't show anything that I make. I must try and find a way as I will be busy with my crafts in the autumn, winter months. All hand stitched, Mo. I haven't mastered the art of machine embroidery yet. 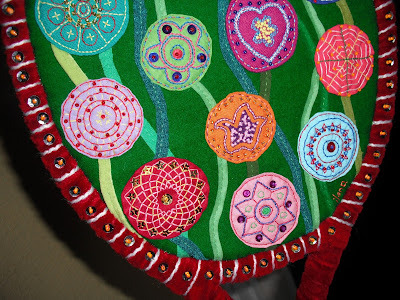 The circles are two inches across, they start as four inches but by the time you have done running stitches around the edge and pulled it into a sort of puff ball, then ironed it flat, they end up half the size. For some of the designs, I made a small cardboard template first. Placed it on the circle, held it between finger and thumb of left hand, and did a back stitch all around the edge of it. I have a box full of small cardboard templates which I keep in case I need them again for other projects. If I see a shape in a magazine or book that I want to keep, I trace it onto greaseproof paper. The one that looks like a spirograph, is that the one you mean, I started by stitching a zigzag circle close to the centre, (no template needed) then added another zigzag around that, then more zigzag circles getting bigger and bigger until it covered all of it. Those are lovely MQ. Do you sell them at craft fairs or anywhere or is it just done for your enjoyment? wildlifemad wrote: Those are lovely MQ. Do you sell them at craft fairs or anywhere or is it just done for your enjoyment? Thank you. My enjoyment is in the making. I have quite a collection of pictures now, when I've finished one I don't like to part with it. Some have been shown in our Arts Centre in the town. Eventually I may sell the pictures, but for now they are wrapped up to keep them clean. The smaller items I sometimes give away, or sometimes sell them and donate the money to our local cat rescue. I make a few felt decorations and sell them at the Christmas Fair. I sold the five skinny dollies last week to the lady in the Post Office and donated the cash to the cats. I make cloth shopping bags, some I sell, and some I give away. I like to surprise people at Tes&co with a free bag. Sometimes people ask me to make something for them, I say sorry, but no. Making to order stifles my creative mind. I have to wait for an idea to appear then put it together. As usual your handicraft is unique and lovely. I really like the horseshoe what a good idea. I still treasure, the beautiful bag you so kindly sent to me. The little hearts are hanging on my bird of paradise plant. Credit where credit's due as they say. Suffolk puffs are easy to make. A circle of fabric, running stitch around the edge, gather it up pull the cotton tight. Flatten the puffball. These can be used for all kinds of embellishments. Add a clasp on the back for a corsage, sew them onto children's clothing, add a length or ribbon to tie up parcels, join lots of them together to make bunting. Thank you Linda. If anyone has any inkling to do some crafty/arty projects, do not rush to the shops to buy materials. Look at the contents of your home first. Old clothes can be cut up and re sewn into something else. Oddments of wool can be knitted into small soft toys. The possibilities are endless. All it needs is a bit of imagination. I save colourful plastic containers. These can be cut up with nail scissors into different shapes. Make cardboard template first. I have some old knitting needles, I don't knit very often so don't need them. 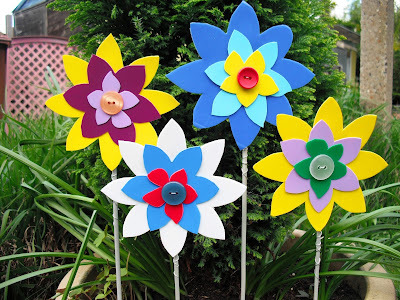 A button and some wire is all that's needed to make flowers to stick in outdoor pots. Brightens the garden up. 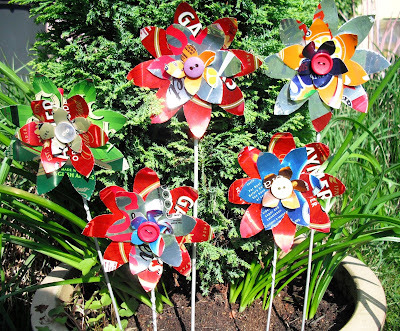 You can also make them with aluminium drinks cans.